You know how it feels when you write a great blog post and nobody ever reads it. Every website does not have a huge follower base, and when you are new it becomes more difficult to reach out to people. This is the most important factor in making your site popular. Sites that publish original content rank higher than sites which publish duplicate content. Having original and useful content also helps in building long term identity and respect for the site with web community. With evolution of social media content quality is now considered as most important factor in ranking of a website. URL’s are what users see in their web address bar, cramped url’s with special characters give no clue about content on a page and reduce the rank of a page. Having clean url’s with no spacial character and with appropriate keyword makes sure to search engines that the page is related to the topic and thus get better rankings. Keywords and phrases are what people search in search engines. If your target keyword appears in page title it may gauge search engines attention pretty easily. Keywords in the beginning of title are considered more important than in the end. Url’s are what people see in their web browser and it also makes sense to have the keyword in your url as it stats out the fact loudly that this url is about the particular topic only. Backlinks pointing to your website. Backlinks can make your site more accessible while making it more reputable. Search engines consider backlinks as one the most important factors in ranking a website. Websites that get backlinks from higher ranked websites are considered quality websites. Domain name should be kept small, unique and related to website content. One should avoid domain names which are complicated and can be misspelled. Domain names having keyword is also helpful in getting the right attention. Site map helps to index your site in search engines properly. It helps to provide search suggestions with appropriate categories and pages. 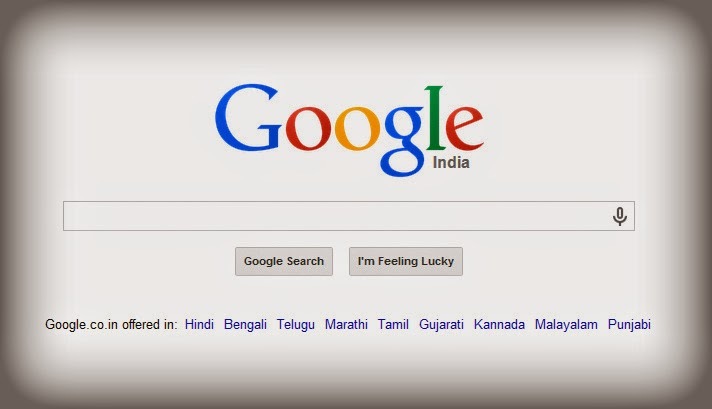 It also tells search engines about site structure and thus helps them in navigating through the pages comfortably. Please share this post and help others if you find it helpful. ask your doubts/questions and provide suggestions using below comment box. I am writing this tutorial for Windows users. However if you want to setup drupal in Linux or Mac OS X. 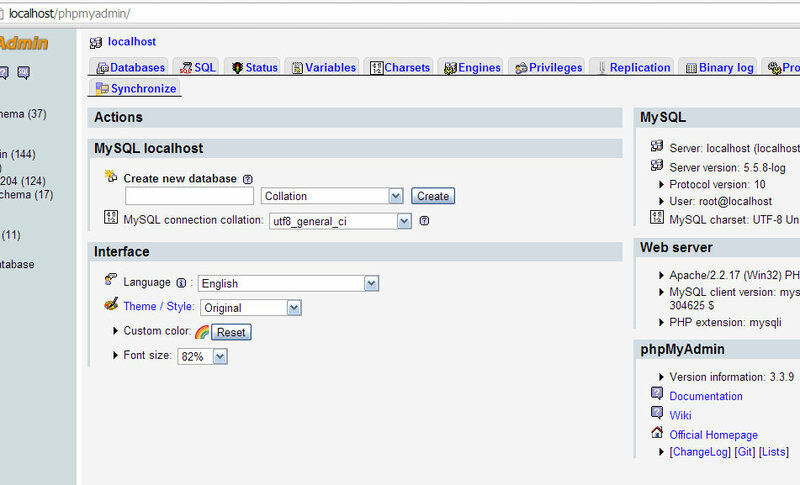 Just google for an appropriate webserver with PHP 5.3 and up and a MySQL database Server. Just open the downloaded exe file and run it, choose a directory where you want to put wamp server files. Chose a partition which has at least 1 GB of space as you will be using it for website setup also. After installing the server go to start menu and click on “start wamp server”, now you will find a logo as “w” in right hand side of the taskbar. Click on it to see all the options to get familiar with it. Now click on start all services. 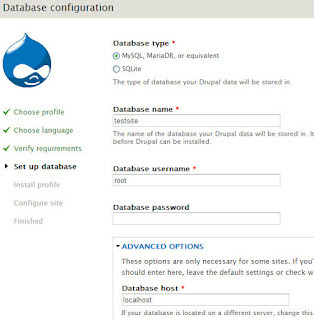 In order to setup a drupal website you will need to have a database which can store site configurations and data for you. 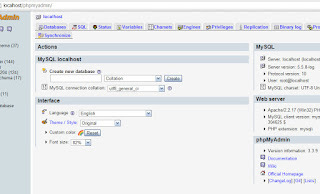 If you have installed wamp server then you already have MySql database installed in your machine. Just make sure your wamp server is running and go to http://localhost/phpmyadmin or click on the phpmyadmin link in localhost page you visited earlier. Open localhost page and Use Ctrl +F in browser window to search for the link if you can’ find it. 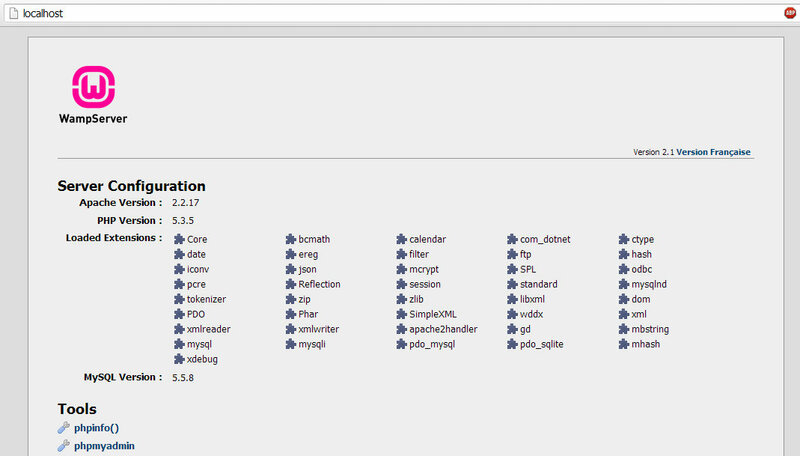 Below is a screenshot of phpmyadmin (it may differ a little bit depending upon the version you have downloaded). Now put “testsite” as a name in the text field for “Create new database” and hit create button. Congrats ! you have created a database for your site. Default username for this database will be “root” and password will be blank. As you are testing only in local you can leave it to default. However it’s a good practice to have strong username and password combination for you database. Go to the folder where you downloaded the drupal zip or tar file. Extract the folder contents and name it “testsite”. Now copy this folder and paste it inside directory named www of your wamp installation. F:\wamp\www\ or anything else according to your installation. The folder structure should be \wamp\www\testsite see below for an example..
Now go to ” testsites/sites/default/” directory and copy “default.settings.php” file and paste it over there then rename the copied file to “settings.php”. Bravo ! you are almost done. Now go to http://localhost/testsite/ on your browser ( Make sure wamp server is running before you hit the url ). You will see something like this..
Leave the default option and click on save and continue. Select your language and one more time click on save and continue. Now enter your database details on the next screen. Click on save and continue. 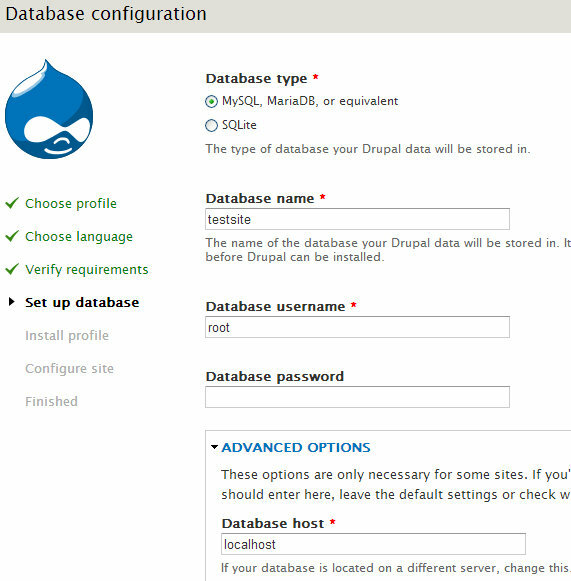 Now sit back and chill for 2 to 3 minutes as drupal will install all it’s module related tables in the database. In the next screen configure the site related information. Please open a notepad and save username and password for your future reference as you will need it to login to administrator area. Look at below screen shot for the same..
On successful installation you will see following message. Don’t worry about the warning as you can not send a mail in localhost. Click on Visit you new website to go to your first drupla site’s homepage. You will get this page as your default home page. 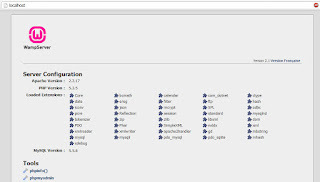 It doesn’t look great as you don’t have any content here and you are using basic drupal theme. So that’s all. 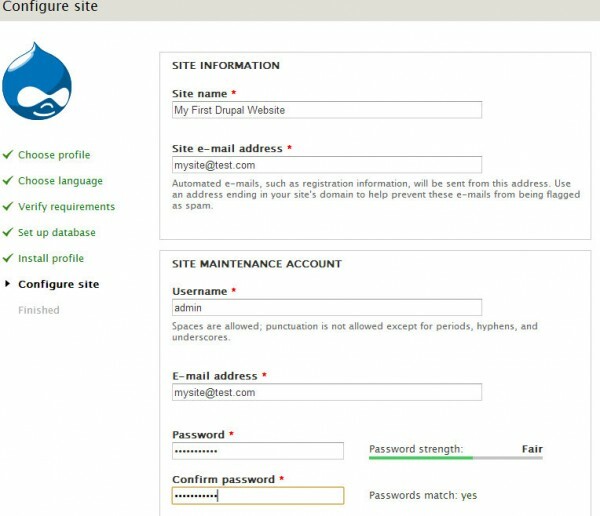 You have setup your drupal website in no time. 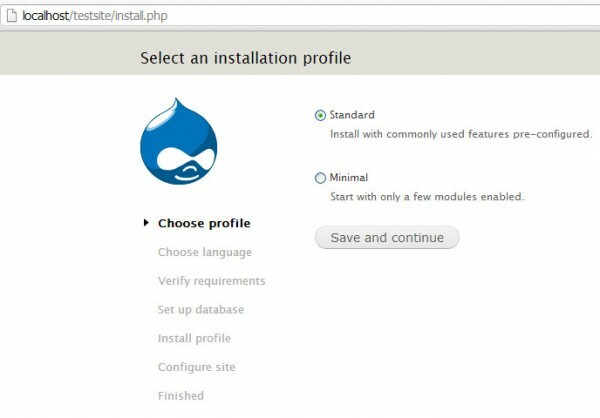 In next tutorial I will show you how to enable drupal modules and content creation using CCK. Meanwhile go through all the admin options on top menu bar and make yourself comfortable with the user interface. Please share this post if you find it useful, ask your doubts/questions and provide suggestions using below comment box.